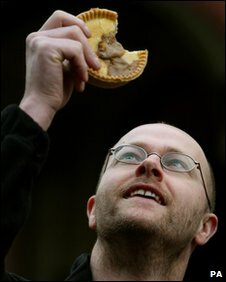 A father-of-two has claimed the World Pie Eating title at the annual championships in Wigan. First-time entrant Barry Rigby, 36, polished off his meat and potato pie in just 43 seconds - eight seconds slower than the world record. Held at Harry's Bar on Wallgate in Wigan on Tuesday, the fastest to digest a pie wins first prize. He vowed to return next year to compete in the contest, which started in the town in 1992. "I was really surprised to win, I think my two boys will be very proud of me. "The pie tasted great. I am a big pie fan, I eat between 10 and 20 a week at least," the Asda supermarket worker added. Random tests were scheduled before the competition to ensure that the avid pie-eaters did not "cheat" by lubricating their throats. Tony Callaghan, owner of Harry's Bar, said random tests would be put into action to make sure none of the competitors was "unfairly lubricated". "Gravy has traditionally been the performance-enhancing drug of choice amongst pie eaters at this level, but we banned it after a series of questionable concoctions were created by contenders," he said. "We're hearing rumours that cough mixture is the new Bisto." In response to a government drive to cut obesity, organisers revamped the competition in 2006. First prize had always gone to the contestant who could munch through the most pies in three minutes, but now it is handed to the fastest eater. Fred Wyatt, a 61-year-old warehouse packer, won last year's contest with a time of 56.28 seconds. He beat world record holder Adrian Frost, 43, who set the current record in 2007.